Keeping cool and wearing cool summer clothes as in fashionably trendy ‘cool’ becomes harder the older you become. 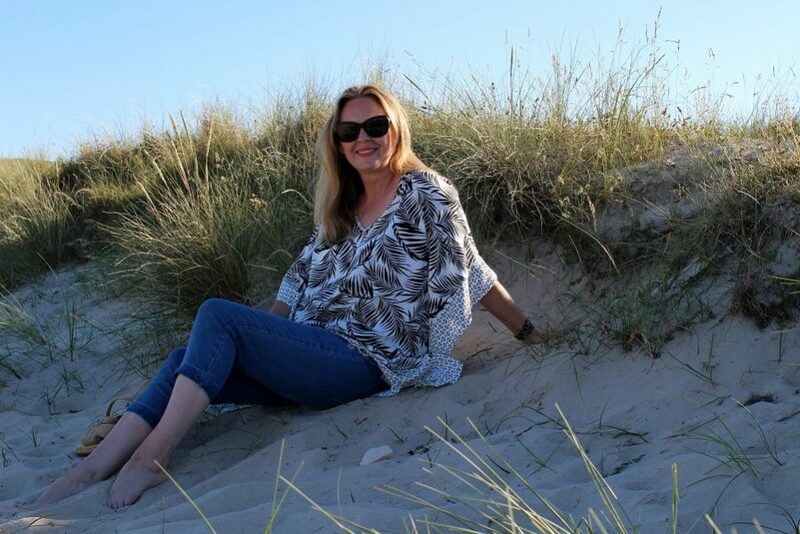 Comfort is key for me now I am in my fifties, but I do still want to be seen as having a little fashion flair too and I am sure it is the same for you too? 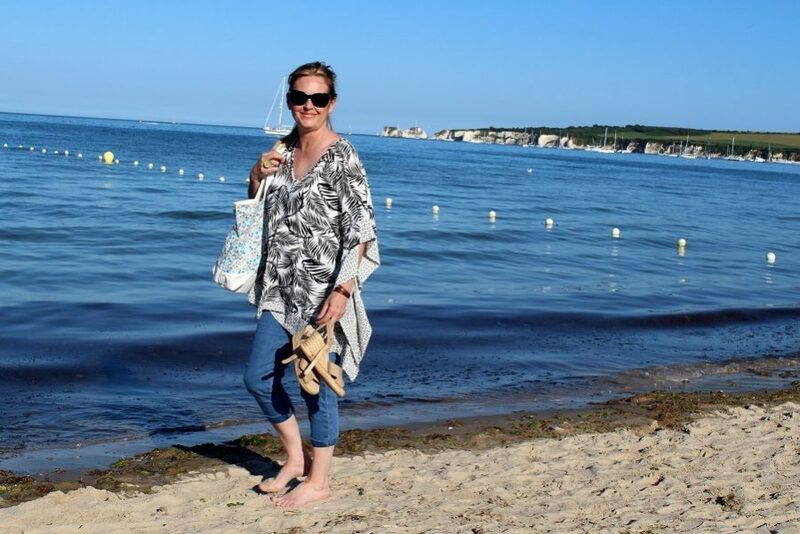 Therefore, I am delighted with the ‘floaty Kimono/Kaftan’ trend this summer cool and ‘cool’ in the truest sense of the word! It also means you can get away with wearing a vest top, because you can cover those arms with a loose kimono style jacket or blouse. If you are petite you just wear a shorter version, length doesn’t matter. 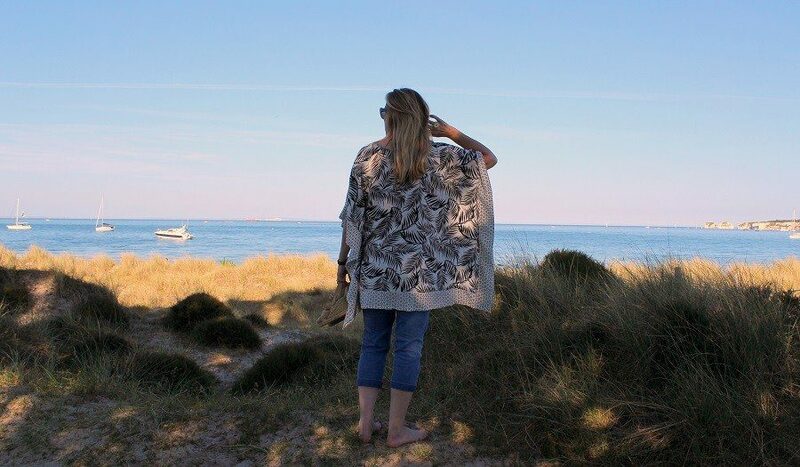 The high street is full of kaftan and kimono style jackets and tops right now. Visit H&M, Zara, Topshop etc. 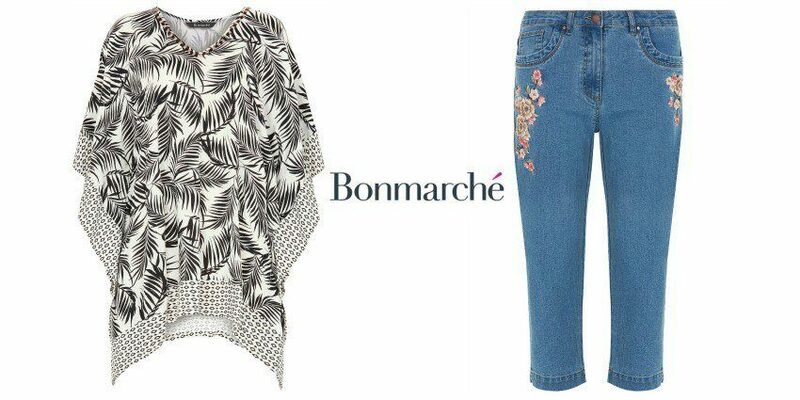 I teamed it with Bonmarché’s embroidered cropped jeans, which are very stretchy and very comfy. I normally wear a size 12 for jeans, but I almost wish I had ordered a size 10 in this style, as they are a good fit but perhaps come up slightly large for me, plus stretch denim gives a lot. 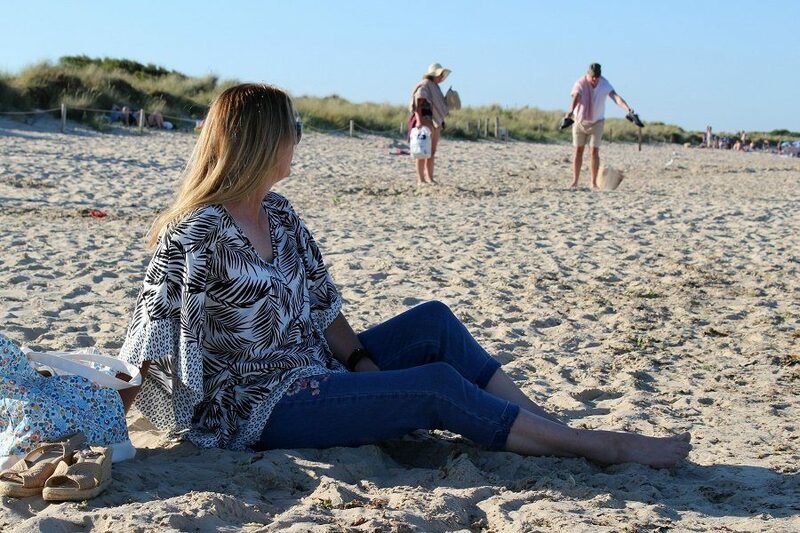 I think this viscose Kaftan top is the star of the show! 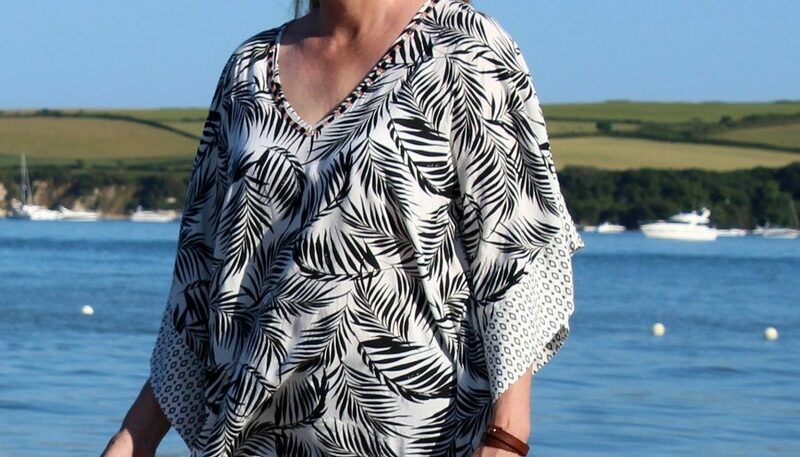 Black and white palm print, it goes with everything, a flattering ‘v’ neck trimmed with pretty beads. Add in a clever contrasting border and you have the perfect throw-on top in a cool summer style! Plus at the moment its on offer for only £15! It comes in S-M or M-L I am wearing the small to medium and its perfect for my size 12-14 top size. 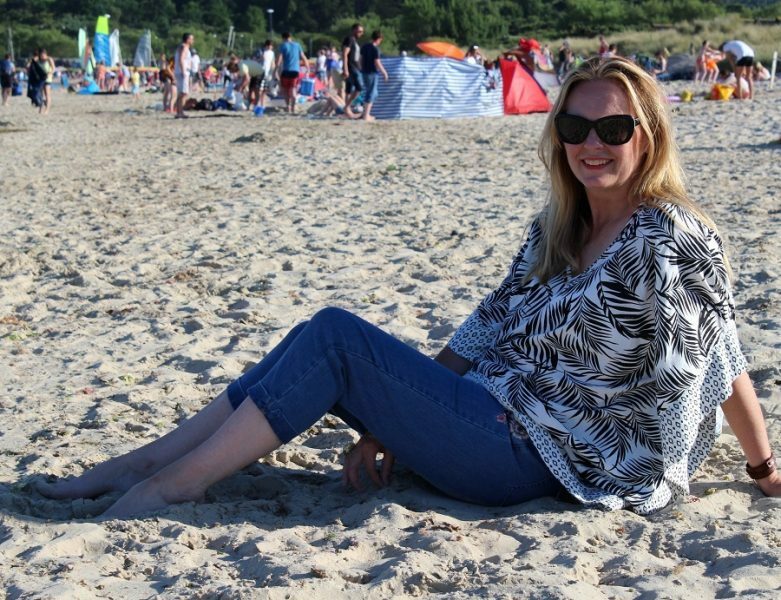 What did you wear at the weekend to keep cool? We were gardening so I chopped up an old pair of trackies into shorts! I really dont think you want to see that pic! Oh yes! and Lucky you! Enjoy your trip! Thank you its a lovely link up thank you for hosting! 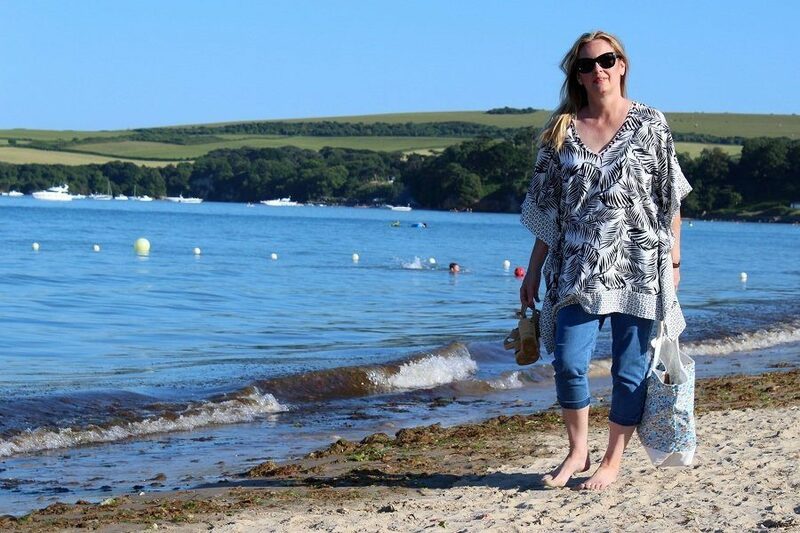 Hi Ashley, this is a gorgeous outfit, the kaftan looks equally as fab with your cropped jeans as I imagine it would over a swimsuit. Thanks Jacqui yes i wore it with a swimsuit in the garden this weekend! I’m staring 60 down the throat myself and it gets a little tougher every year to find clothes. I think that this year will feature a lot of cotton sundresses for me! I agree, the looser the better for me too! Hello and thanks Laurie I too think its a bargain at that price! Beach pics are the best!